Add some crunch and contrast to any meal with this easy and nourishing celery salad. A super-rich blend of yogurt-mayo-lemon dressing brings great flavors where the pecans and dried cherries add amazing texture to this salad. You can use any dried fruit or nuts of your choice instead of the cranberries and walnuts. 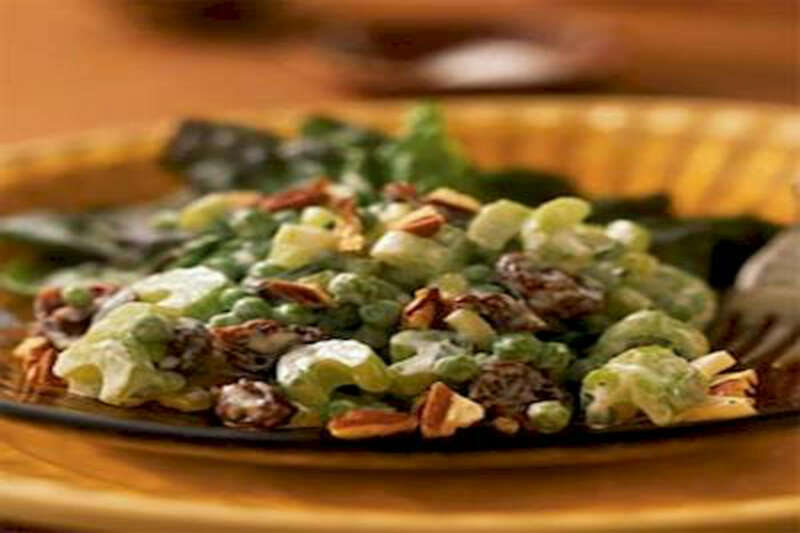 RecipeSavants.com Add some crunch and contrast to any meal with this easy and nourishing celery salad. A super-rich blend of yogurt-mayo-lemon dressing brings great flavors where the pecans and dried cherries add amazing texture to this salad. You can use any dried fruit or nuts of your choice instead of the cranberries and walnuts. Smart Recipes, American Recipes, Vegetables Recipes, Recipes Vegetables American Celery Salad PT15M Serves 2 Ingredients: 0.75 Cup Sliced Celery 0.33 Cup Dried Sweet Cherries 0.33 Cup Frozen Green Peas 3 Tablespoons Chopped Fresh Parsley 1.5 Tablespoons Fat-Free Mayonnaise 1.5 Tablespoons Plain Low-Fat Yogurt 1 Tablespoon Chopped Pecans 1.5 Teaspoons Fresh Lemon Juice 0.125 Teaspoon Salt 0.125 Teaspoon Black Pepper In a large bowl, add all ingredients and mix well. Refrigerate to chill before serving.